Our unique program concentrates on mind, body, spirit via bungee. This dynamic, fun, empowering, and enlightening program is more than just skills and reps. Ground Aerial’s® expertise in teaching pedagogy coupled with almost 2 decades of professional aerial experience make this course one of the most highly sought-after certification programs in the world. What makes Grounded Aerial® Bungee Training special? Q: Why Grounded Aerial® Bungee Training certification over the other guys? A: Experience! Bungee dance, in the United States, and the world for that matter, is quite new and uncharted territory. So, we here at Grounded Aerial® take our pioneering and innovative system very seriously, as we realize that we are setting the bar for all to follow. I have been teaching and performing aerial bungee for the last 18 years, I have been a professional dancer in NYC for 20 years, have my Masters Degree in Dance Education from NYU, and own an aerial dance company which performs in different venues around the world. Paul, the owner of Adrenalin Dreams endorses Grounded Aerial®. He is one of the leading manufacturer of bungee systems in the world. I say this to legitimize my history, and to give you some highlights of my biography. I have developed and honed the GA®BT system slowly, mindfully, and with fine-tuned mastery. It is my passion. It is an honor and joy to bring aerial bungee movement to the masses, and I would love to talk to you more on the phone to answer any questions. Our legitimacy is of great importance, and we certainly have the history, creative and pragmatic focus, spotless safety record, and testimonies to illustrate just that! I wanted to let you know I taught my first five (yes five!) bungee classes this weekend. They went really well — all five were sold out! And, I said “surrender” and “#justlikelife” in every class!Thank you again so much for the great training. Karen’s passion for bungee training is infectious! Just did the Harleysville training and it was such a cool and fun experience! The training is so informative and she really devotes herself to helping you learn every aspect of the course! Jason, Phoenix and Rabbit were awesome too! Cannot wait to do this on a regular basis! Grounded aerial is absolutely one of the best places to meet great people, get a great workout, and learn something about yourself that you never thought you could do before. As an aspiring professional dancer and performer and teacher, I admire Karen for what she does and how she has such a passion for aerial bungee and passing that knowledge and love on to others. I’ve just completed the course in Wales and it was amazing! Karen and Jason are so welcoming I felt at ease immediately. Thank you so much guys. Super crazy amazing! Energy was off the chart and I love the idea of every aspect of this new fitness genre!!! CANT WAIT TO TEACH IT!! I just completed the Grounded Aerial Bungee Training Certification which was held in Los Angeles. Such a great experience! Karen and Jason are awesome teachers..extremely knowledgeable with the ability to convey that knowledge. The class was well structured and super informative. I felt support from both of them on all levels which created an atmosphere of trust, relaxation and acceptance. And oh so much fun! Q: Do I need aerial experience to become certified? A: Absolutely not! A movement background helps, but everyone can learn how to fly, and how to teach it with safe, efficient ease. Grounded Aerial® Bungee Trainers demonstrate excellence in all domains. 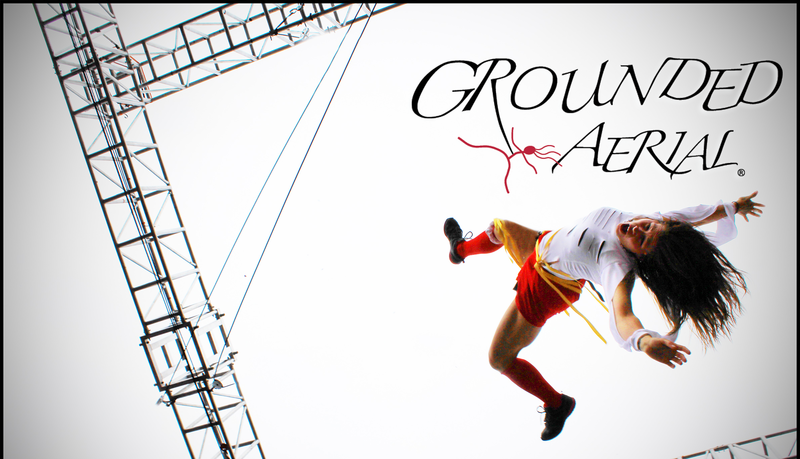 Grounded Aerial® aspires to maintain a spotless safety record as well as artistic excellence. Depending on the exam results, Grounded Aerial® will either mail the certificate immediately, or potentially require a 6 week probationary period for students that have not completed the requirements of the exams on a satisfactory level. If needed, we ask for the students to study the exam and send in changes from their original test, and to send video of their movement progress on their bungee system illustrating competence and growth in understanding the terms/repertoire. Please know that we are here to help, and anyone (with diligence and perseverance) can become certified! Q: How much does bungee equipment cost? A: An entire bungee rig complete with all attachment hardware is under $360. Harness options range from $70 to $450 depending on model/supplier. During the certification, Grounded Aerial® supplies harnesses manufactured all over the world. This allows you to try before you buy. Our years of harness research and first-hand experience, enable us to help find the harness that fits you and your budget. Q: What kind/brand of harness do I need? A: Grounded Aerial® supplies harnesses manufactured all over the world. This allows you to try before you buy. Our years of harness research and first-hand experience, enable us to help find the harness that fits you and your budget. Grounded Aerial® repertoire includes front point and back point terms which is important to remember when harness shopping. Very few standard rock climbing harnesses are equipped with back attachment points which is why we prefer professional aerial harnesses with multiple attachment points. The Wall Walker from Adrenalin Dreams is one of our favorite harnesses. It provides ample padding, multiple attachment points and is moderately priced at $280. Q: What is the licensing fee? 3. Monthly “Watch a full class” developed by Owner and Artistic Director Karen A. Fuhrman. This is executed by the professional aerialists of Grounded Aerial Core Performers. 4. Blog for international support, business networking, problem-solving, troubleshooting, creative ideas, and community. ​5. Comprehensive music play lists that guide the time, skill element, music tempo, and specific focus. 6. Videos from GA®BT instructors from around the world are selected monthly and are highlighted on our website. Promoting your gym at a global level. Q: Can you travel to us, and certify GA®BT at our studio? A: Yes! We have toured through out the United States and other countries such as Canada, Brazil, Guatemala, France and soon the UK. The minimum amount of clients for us to come to you is five students in the GA®BT certification. The max we have worked with is twenty-two clients! That particular workshop was a 24-hour course that spanned over 4 days. We tweak the certification with each studio, depending on their demographic and clientele. Our goal is to have a symbiotic relationship where each party helps the other. -Airfare for two. Paid in advance by Host, four weeks in advance. -Housing. Paid in advance by Host, four weeks in advance. -Uber, Lyft, rental car or transportation from airport and through duration of certification. -Per diem. Full amount given day of arrival in county’s currency. $60.00 per day, per person (1st day of arrival, working days, and day of departure). We want to help you grow! It’s a serendipitous working relationship and we help each other. If we need to negotiate to help your vision actualize, we make that happen. We find wiggle room in budgets, we ask questions, and we form a community that is rich with support and assistance. We could potentially split the bill (as far as airfare and housing) with another studio that might be interested in the area. We have done this before. Q: What are the ideal dimensions for Grounded Aerial® to come to my studio? A: The ideal studio ceiling height would be 12 ft or higher. We can have lower, but that would necessitate purchasing additional bungees for your particular studio. Square footage around 30 feet by 30 feet. This is quite large, and we can go smaller, as well! Ceiling points every 10 feet is ideal. 8 feet between points is the minimum distance Grounded Aerial® recommends for points used simultaneously. Q: Do you teach other classes? A: We do this too! Karen, is a professional dancer that is a professor at a University, and Jason has been coaching for the last 20 years. While we certify your trainers in GA®BT, we can also offer straight Modern, Jazz, and Musical theater technique, tumbling, improvisational, varying aerial apparatus classes, choreographic development, line for the circus artist, juggling classes and more. We figure, if we are there on your turf for a period of time, why not offer additional options as well! Straight technique classes for ALL adult levels in: Modern, Ballet, Musical Theater, Jazz, Tap, Tumbling, Ninja obstacle courses, Juggling…and more. Choreography Development and Creation (for professionals to 6 year olds– really! Everyone can make dances.) I toured around the world holding workshops such as these via the modern dance company Pilobolus. The end result is choreography that is really fascinating and totally organic. I have developed this concept for aerial choreography classes as well. Line for the Circus Artist. A class for professionals or pre-professionals to work on their ballet, stretch, and length. Stretch for All- The advantages of stretch have been proven scientifically as a giant aid to health and happiness. A combination of yoga, ballet, and pilates accessible to all levels enables enhanced movement to all types. With my Masters in Dance Education, and experience in teaching all over the world, I gently and diligently assist each person to relax, strengthen, let go, and stretch via breath, imagery, and anatomical aides. Contact Improv class/ Weight sharing classes- learn to move with a partner and develop muscles and communication skills that enhance your physique and ability to interact and problem-solve with others. For ALL ages and movers. GA® Bungee Classes- bounce like a baby in a bouncy chair while getting the world out of your life- and abs of steel. If you have dreamt of soaring through the air with larger than life leaps- then take this class. Wall Dancing Classes– A ridiculous work out, perspective shifter, a really fun time– and another reality of the horizontal aerial world! Q: How can I involve my local community and stir up more interest? A: Grounded Aerial® encourages community enrichment programs. This helps give a communal feel for the locals (all levels for children and adults). After a week or month of classes/workshops, they’re usually is an informal or grand showcase of the work that was created. The community really appreciates the opportunity to show off their new skills, and people tend to get very excited to try bungee for themselves! Great fun, and great publicity. Q: Do you have a performance troupe? A: Grounded Aerial® Core Performers can share the stage for the showcase and perform segments of our repertoire or we can also perform a full even-length show. We always look forward to developing a perfect mix that works best for your gym or studio, your clients, and the community within the time frame that is ideal. Q: How do I register for training/licensing agreement? 1. Select a contract option below. You will be prompted to create account. 2. Enroll for Grounded Aerial® Bungee Training at preferred location & date.